The Luxury Travel Bible says: Chichen Itza is the sacred location is one of the greatest Mayan centres of the Yucatán peninsula. It is considered to be the most important archaeological display of the Maya-Toltec civilization in Yucatán (10th-15th centuries). Despite its nearly 1,000-year history several building have survived, making it a popular attraction for tourists. It was granted World Heritage Site status in 1988 by UNESCO World Heritage Site and in 2007 was named as one of the New Seven Wonders of the World. 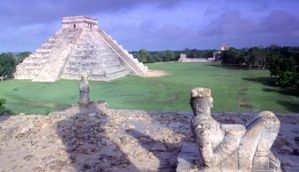 Club Exclusive member, Matthew Plested visited Chichen Itza while on his Mexican honeymoon and shared his experience for fellow The Luxury Travel Bible readers. Why did you choose Mexico for your honeymoon? We wanted to go somewhere we had never been before with guaranteed sunshine. I had never been to the Americas previously and the hotel seemed to have that 'something special' that we wanted for our Honeymoon . 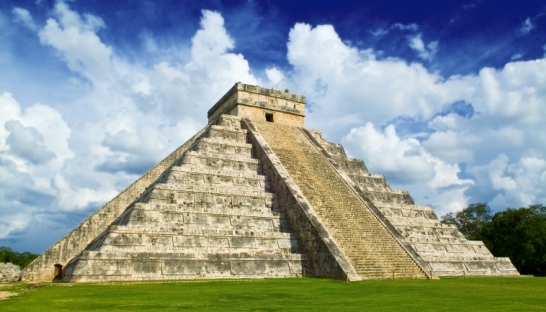 Why did you decide to visit Chichen Itza? We met at University while both studying History so we both have an interest in history. We always visit something historical while on holiday, previously going to places like the Giza Pyramids in Cairo. Chichen Itza is the most famous historical site in Mexico and a new Wonder of the World so it was an opportunity not to miss. It was a long journey (around three hours) to travel from the hotel in Riveria de Maya to Chichen Itza. We had two stops (one for a swim and one for lunch) on the way and the most fantastic guide that made the journey go quickly by. At arriving at the Mayan city Chichen Itza itself our guide gave us a tour of the ruins explaining each building on the site before having time to wander around at our leisure. Our guide was a fully qualified Archaeologist who had worked for several years on the Chichen Itza (he sadly makes more money as a guide) so it wasn''t your normal bad history that you can get from tour guides. The pathways on the site are completely flanked by locals selling souvenirs, many of which cost only 1 US Dollar! This is the place to get your souvenirs as everything is sold for a fraction of the price you will pay elsewhere. There are unfortunately few ruins that you are permitted to walk on due to vandalism in the past. Chichen Itza was a most enjoyable experience. The famous step pyramid is the most impressive feature but the sheer size of the city and the complexity of the surviving building is also so. I was surprised at how big the site is as I had thought the site to be mainly involving around the pyramid. 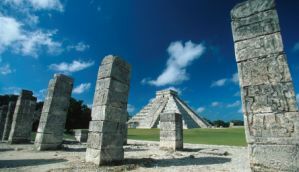 Chichen Itza is much more than that though, with many well-preserved buildings to see. What is more remarkable is that it the majority of the former city has been swallowed up by the jungle and we see just a fraction of what used to exist. There is also no hassle from the souvenir sellers, which is welcome after experiencing hassle elsewhere such as Egypt. What did your (new) wife think? My wife shares my feelings that is was an enjoyable and interesting day but I also know one of the first things she would say is that it was very, very hot! There is very little hiding from the sun and a hat and a bottle of water (as advised) were necessities to avoid boiling alive. Absolutely! If you have the chance to visit a Wonder of the World, you must take it. You won't be disappointed. A lot of people say they are disappointed with the size of the Giza Pyramids when they visit, I found this to be the opposite at Chichen Itza. Which hotel were you staying at? El Dorado Seaside Suites by Karisma, Riviera De Maya. We stayed in an Ocean Front Jacuzzi Double. We couldn't have asked more from the room. We had an extremely comfortable bed and Jacuzzi and the minibar and DVD/CD player were inclusive. There is a choice of five à la carte restaurants andall ofthe food was outstanding. There was the choice of the beach or two pools, one with a swim up bar. Warning - just because mojitos don't taste like alcohol, doesn't mean they are not extremely alcoholic. Room Service and a concierge service were also included. The staff just couldn't do enough for you and were all very friendly. On our arrival we had a bottle of champagne on ice waiting for us as well as a bath prepared in the Jacuzzi. As honeymooners, we were also given a seafront candle-lit dinner and a massage lesson from the hotel's spa. Photos courtesy of Mexico Tourism Board.